Sewing Kits are highly valued by mid to high tier players for their use in both roadsign and metal Armour. You will gain more rope recycling sewing kits one by one as they each give you 2 rope. Recycling them two at a time only gives you 3 rope per 2 sewing kit. 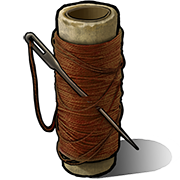 You are able to buy a sewing kit for 8 scrap buy buying and recycling tactical gloves at the outpost. This currently the easiest way to get sewing kits.